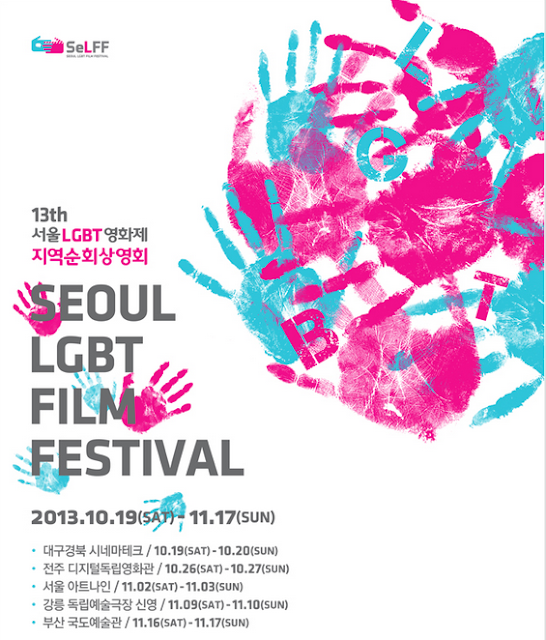 Missed out on the 2013 Seoul LGBT Film Festival in June?? No worries! The festival is traveling around Korea in the upcoming month. This weekend (10/19~10/20) it will be at the Daegu Kyeongbuk Cinematech. The following weekend (10/26~10/27) you can see the films at Jeonju's Digital Independent Film Theater. The first weekend of November (11/02~11/02), Seoul will host the festival at Art 9. Over on the east coast in Gangneung, you can see the film at the Independent Art Theater Shinyeong on the 9th and 10th of November. The festival will finish its travels at the Busan Kukdo Art Hall (11/16~11/17). If anyone wants information about a specific theater's location, let me know in the comments and I'll try to figure it out for you.